The Final Countdown is a battle minigame in Mario Party 7, and returns in Mario Party: The Top 100. Its name comes from "The Final Countdown", a song by the 1980's hard rock group Europe. The panels start at two, then count down to zero and open. They then reset to random numbers as the players head in from the sides and leap onto the platform. The playing field is a platform with nine panels. There is a number on each of the panels (1-9), and the numbers on each panel decrease by one after a certain time period. 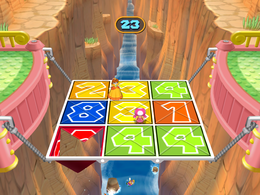 If the number on a panel reaches zero, the panel gives way, eliminating any player standing on it, then automatically resets to a random number from one to nine. Competitors can move and punch and kick their opponents to try and force them off the whole platform or into a hole. Additionally, the countdown speed increases as the game progresses. The last player standing on the number panels wins the minigame. If all players fall simultaneously, a random winner is decided. In Mario Party 7, Fly Guys drop the other three players onto the platform. The winner then performs a victory pose. Rules – "Shove foes off the platform, but watch the numbers! The panels break when they reach zero." Advice – "Watch the panels carefully! The countdown will speed up as the game progresses." Description – "Punch and kick your rivals to knock them off, but don't get caught on a panel when it counts down to 0!" On-screen – "Knock off your rivals and watch for open panels at 0!" This page was last edited on January 28, 2019, at 19:26.